The Wii U launches November 18th and both the Wii U Deluxe and Wii U Basic models are selling with big markups on secondary markets like ebay and Amazon. 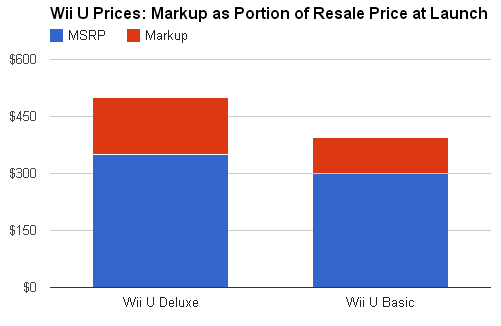 Wii U Deluxe appears to be the more popular of the two options with an average resale price of $501, which is 43% more than the MSRP of $349.99. 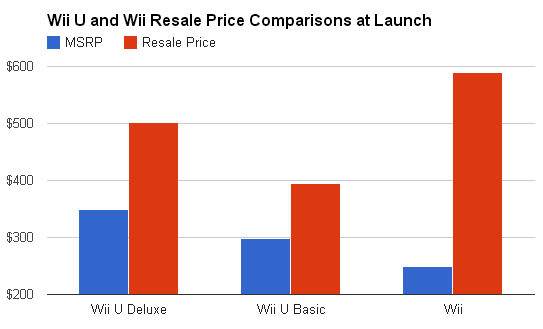 Wii U Basic sells for a 32% premium on the resale market for an average of $395. These big premiums are still a far cry from the original Wii resale prices when it launched in 2006. Within a week of launching the Wii Console was selling for $570 on average and the retail price was $249.99. That's a huge 129% increase in price! We will track the daily resale prices for both Wii U Consoles in our Wii U Price Tracker. If the console sells out everywhere prices could spike during Black Friday as parent's try find the toy for their kids. Or prices might plunge if the console turns out to be easy to find. Check back to see where Wii U prices go. So if I got one to sell, when would you recommend I sell it: right away or wait until Black Friday? I personally would recommend you sell it ASAP. My guess is Nintendo is going to restock before Black Friday. BUT if the Wii U turns out to be the "must have" item of the season like Wii did in 2006 and 2007 then Nintendo won't be able to stock enough and after Black Friday would be best. If I had to decide I would sell now though and lock in some money. I'm selling mine as fast as possible but listed it for 600 since there is no where locally that has not sold out. Thanks for getting this up so fast! Has anyone heard if Nintendo has said if they think they have enough production up and running? @ccc - Iwata, Nintendo's President, said the console will probably be supply constrained at launch. They project selling 5.5 million consoles by March 2013 (from Nintendo financial statements). Even if all of those were available on launch day they would have to split the supply among three territories which leaves 1.83 million per region on average. I'm pretty confident the Wii U will be supply constrained. The question is just to what extent. Enough where it is worth it for people to resale for profit, or just enough where people have to pay a bit of a premium online. We will have to wait and see.